Baron John William Strutt Rayleigh, better known as Lord Rayleigh, was awarded the 1904 Nobel Prize in Physics "for his investigations of the densities of the most important gases and for his discovery of argon in connection with these studies." Although he held positions at Cambridge University, much of his research was conducted in his own personal laboratory on his family estate in Terling, England. He is best known for his part in the discovery of the element Argon, but his work covered a wide range of subjects within the field, including acoustics and the theory of sound, electromagnetism, and even the theory of color and optics. November 12, 1842Birth, Maldon (England). 1864Awarded Smith's Prize, Cambridge University, Cambridge (England). 1965Obtained BA degree, Trinity College, Cambridge University, Cambridge (England). 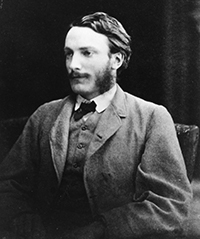 1865Named Senior Wrangler, the top student of the Mathematical Tripos, Cambridge University, Cambridge (England). 1866Elected Fellow, Trinity College, Cambridge University, Cambridge (England). 1868Obtained MA degree, Trinity College, Cambridge University, Cambridge (England). 1873Inherited his father's title and became the 3rd Baron Rayleigh. 1873 – 1908Fellow (1873); Secretary (1885); and President (1905-1908) Royal Society. 1876 – 1878President, London Mathematical Society. 1877 – 1878Published two volumes of his famous text, "The Theory of Sound". 1879 – 1884Cavendish Professor of Experimental Physics, Cambridge University, Cambridge (England). 1882Awarded the Royal Medal, Royal Society. 1887 – 1905Professor of Natural Philosophy, Royal Institute, London (England). 1892 – 1902Lord Lieutenant of Essex. 1894Awarded the Matteucci Medal, Italian Society of Sciences. 1894Awarded the De Morgan Medal, London Mathematical Society. 1896 – 1919Scientific Advisor, Trinity House. 1897Member, Swedish Academy of Sciences. 1899Awarded the Copley Medal, Royal Society. 1902Received the Order of Merit. 1904Awarded the Nobel Prize in Physics, "for his investigations of the densities of the most important gases and for his discovery of argon in connection with these studies". 1908Chancellor, Cambridge University, Cambridge (England). 1913Awarded the Elliott Cresson Medal, Franklin Institute. 1914Awarded the Rumford Medal, Royal Society. 1919President, Society for Psychical Research, London (England). June 30, 1919Death, Terling (England). Son and 4th Baron Rayleigh. Advised by Rayleigh at Cambridge University. Collaborated to discover the element Argon. Advisor at Trinity College, Cambridge University. Cavendish Professor of Experimental Physics and Chancellor. Awarded the Matteucci Award (1894). Awarded the Elliott Cresson Medal (1913). President and awarded the De Morgan Medal (1890). Fellow; Secretary; President and awarded the Royal Medal (1882), Copley Medal (1899), and Rumford Medal (1914). Awarded the Albert Medal (1905). Received BA degree (1865) and MA degree (1868). Named Senior Wrangler (1865); awarded Smith's Prize (1864); and Fellow. Baron John William Strutt Rayleigh papers, 1860-1870. Baron John William Strutt Rayleigh papers, 1864-1919 [microfilm]. Phillips Laboratory. Geophysics Directorate. Research Library. Baron John William Strutt Rayleigh papers. John William Strutt Rayleigh papers [microform], 1864-1919. Willard L. Severinghaus papers, 1895-1947. Albert Michelson papers, 1803-1989 (bulk 1861-1965). Arthur Schuster letter to John William Strutt, 3rd Baron Rayleigh, 1880. Baron Robert John Strutt Rayleigh notebooks, 1910-1947 [microform]. Edgar Buckingham handwritten transcripts of correspondence with Lord John William Rayleigh, 1915-1916. Edward Williams Morley papers, 1833-1923 (bulk 1863-1899). John William Strutt Rayleigh and Robert John Strutt Rayleigh collection, 1865-1976. Lord Rayleigh typescript notes and abstracts, circa 1924-1945. Oliver Lodge correspondence, 1874- 1938. Oral history interview with Niels Bohr, 1962 October 31, November 1, 7, 14, and 17. Sarah Frances Whiting papers, 1859-1927. William Henry Bragg papers, 1889-1960. Die theorie des schalles / von J.W. Strutt, baron Rayleigh : Autorisirte deutsche ausg. Uebersetzt von dr. Fr. Neesen : Mit in den text eingedruckten holzstichen. Mathematical and physical papers / by George Gabriel Stokes ... Reprinted from the original journals and transactions, with additional notes by the author. On the light from the sky, its polarization and colour, 1870. Theory of heat / by J. Clerk Maxwell. John William Strutt, third baron Rayleigh, O.M., F.R.S., sometime president of the Royal society and chancellor of the University of Cambridge / by his son Robert John Strutt, fourth baron Rayleigh. Life of John William Strutt, Third Baron Rayleigh, O.M., F.R.S., by Robert John Strutt, Fourth Baron Rayleigh. Lord Rayleigh Nobel Prize biography. Men of physics: Lord Rayleigh- the man and his work. The Rayleigh Archives dedication / [By] J. N. Howard, editor.